Guns N' Roses have scrapped a sightseeing trip to Jerusalem ahead of a Saturday night (July 15) concert in Tel Aviv following a terror attack. Axl Rose and his bandmates were planning to visit the holy city on Friday (July 14), but the rockers' walkabout plans have been derailed by a shoot-out between terrorists and police. Reports suggest three Palestinians were shot and killed as they opened fire on police officers outside the holy site of Temple Mount. Two Israeli cops also lost their lives in the early morning incident on Friday. Temple Mount was closed following the deadly shoot-out for security reasons, and all activities at the site were suspended. Guns N' Roses aides felt a Jerusalem city tour following the drama would be insensitive and cancelled plans. 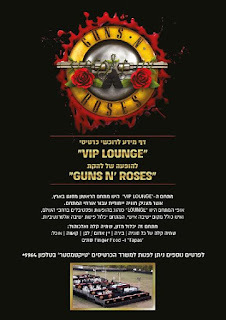 The band's Saturday night concert in Tel Aviv is also making headlines for the wrong reasons after a decision to start the show earlier upset local religious leaders, who claim Jewish fans would be forced to choose between making it to the gig on time or observing the Sabbath, which will now end as Guns N' Roses take to the stage. Rose and his bandmates have also been criticized by their peers for refusing to boycott Israel on their ongoing world tour. Stars like Roger Waters and Sonic Youth founder Thurston Moore have called on musicians to stay away from the country until leaders make peace with their Palestinian neighbors. Meanwhile, the rockers aren't the first musicians who have had to scrap plans to tour the holy sites of Jerusalem in recent weeks - Britney Spears had to cut short a sightseeing tour of the ancient city on July 2 when she was mobbed by fans ahead of her first gig in Israel on July 3.